Last week I was in the Chicago area for business and managed just enough time for quick stop at a great Video Retro Game shop…Video Games Then & Now. Just a short drive from O’Hare, Video Games Then & Now is at 4351 North Harlem Drive in Norridge, IL. The shop is staff by friendly folks and has an amazing collection of systems, controllers, parts, and games for everything from the Atari 2600 to the X-Box. In fact I saw games for the Atari 2600, 5200, & 7800 systems as well as Intellivison, Colecovision, Sega Genesis, Vectrex, and many more. The prices are really fair (I picked up a number of 5200 and 7800 carts for as little as $1 each) and they will buy your old games or take them in trade. I also picked up a brand new (still boxed) controller for my 7800 as well as a boxed 7800 game. If you happen to be in the Chicago area, then you owe it to yourself to stop in and check out this great shop! Categories: 2600, 5200, 7800, Atari | Tags: Atari VCS 2600 5200 7800 | Permalink. Pole Position is a 1982 racing video game developed by Namco. It was licensed to Atari for release in the US and became a smash hit. It was the most popular coin op game in 1983 and Atari sold more than 20,000 Pole Position arcade units. Pole Position came in both an upright cabinet and a ‘cockpit’ cabinet where the player could sit inside. In the game, the player controls a Formula One race car on the Fuji racetrack. First you must qualify your car, then race against computer opponents. One of the iconic moments in the game is at the start when you hear ‘Prepare to Qualify’. Pole Position was one of the first video games to have product placement. Billboards in the game feature company logos including Agip, Cannon, Champion, Marlboro, Martini, Namco, and Pepsi . These logos varied by country and included Atari, 7-Eleven and Dentyne in the US. The arcade units were powered by a Z80 CPU and Namco sound units. Pole Position was ported to a number of home consoles including the Atari 2600, 5200, and 7800, the Intellivison, and the Vectrex. 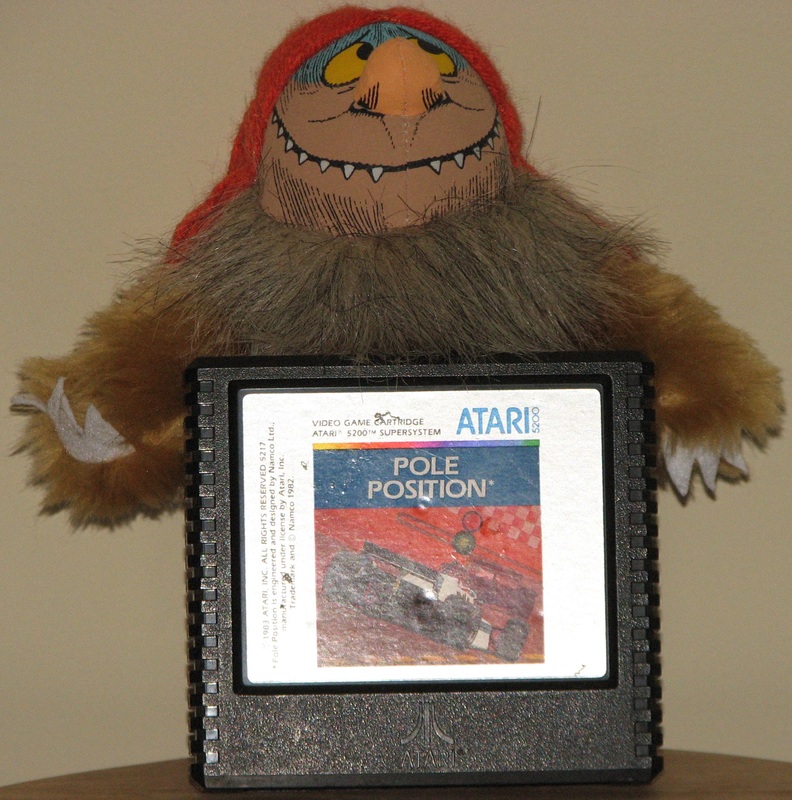 The 2600 version of Pole Position was released by Atari in 1983. Play is close to the arcade and control with a standard Atari joystick is solid. Most reviewers give Pole Position high marks, but I am not impressed with the 2600 version. The graphics are horrible and don’t look anything like the Fuji race track. The computer generated opponent cars are ‘blocky’ and you have to use a lot of imagination to see them as Formula One race cars. Also there are no billboards and the crash graphics are pretty lame. Even for a 1983 2600 game, Atari should have been able to do a better job with the graphics. The 5200 version of Pole Position was also released by Atari in 1983 and, compared to the 2600 version, it must have seemed pretty amazing. The graphics are dramatically improved and the track definitely looks like Fuji. The cars are less ‘blocky’ and control with a standard 5200 analog joystick is solid. The game play is very close to the arcade and it is challenging to weave your way around all of the computer generated opponents. Surprisingly, the ‘Prepare to Qualify’ announcement at the start of the game is missing. Given the awesome voice synthesis in Berzerk, we know it is possible to do this on the 5200. As good as Pole Position is on the 5200, it could be even better. The billboards are present, but they are all blank and it should be possible to make the cars less ‘blocky’. All in all Pole Position on the 5200 is a must have for any 5200 collector. It was the initial ‘pack in’ game for the 5200 and is inexpensive and vey easy to find. The 7800 version of Pole Position was developed in 1984 and released with the system in 1986. Actually, the 7800 version is Pole Position II which is even better! It features the option to select one of four tracks to race and dramatically improved graphics over the 5200 version. Both the player’s and the computer generated opponent cars actually look like Formula One race cars and billboards are present (even if they all have Atari logos on them!). One thing that really stands out in the 7800 version is the crash graphics. The ‘explosion’ actually looks pretty good and it is cool to see the tires bouncing away from the car. The sound effects are also pretty good, considering that this is one of the weak points of the 7800. Unfortunately, however, the ‘Prepare to Qualify’ announcement is still missing. Pole Position was the ‘pack in’ game for the system and was also sold separately. It is easy to find and inexpensive, often selling for as little as $1. A copy of Pole Position II belongs in every 7800 collection. If you only have one Atari console, then, by all means, pick up Pole Position for which ever system you have. If you have more than one Atari console, then the 7800 version, with better sound and graphics and four tracks to play, is the clear winner! Categories: 2600, 5200, 7800, Atari, Game Reviews | Tags: Atari VCS 2600 5200 7800 Pole Position | Permalink.